A Dutch View Your guide to Holland, for visitors and expats. Before we had kids, I’d spend hours in the kitchen. I still love cooking but now time (or lack of it) plays a big role in what I cook. Thankfully, a few of my “old classics” still fit into life as a parent. I’ve been making these scones for years, and I hope I’ll be making them for many more years to come! Our favourite scones, fresh out of the oven. This batch was made with raisins. They’re so easy to make, and absolutely delightful when smeared with butter and served alongside a cup of tea. One of the things that makes them so simple is the fact that you don’t bother with rolling out the dough and cutting perfect little circles. Instead, you simply pat the dough into a round shape, transfer to a baking mat and slice the circle into eight triangle-shaped wedges. Scones: ready for the oven. 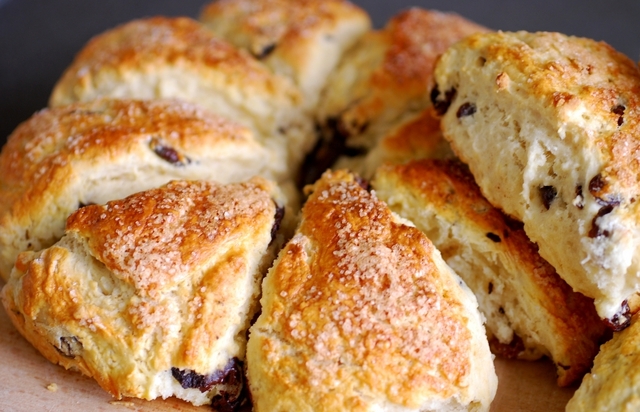 These scones are not only easy, they’re versatile. 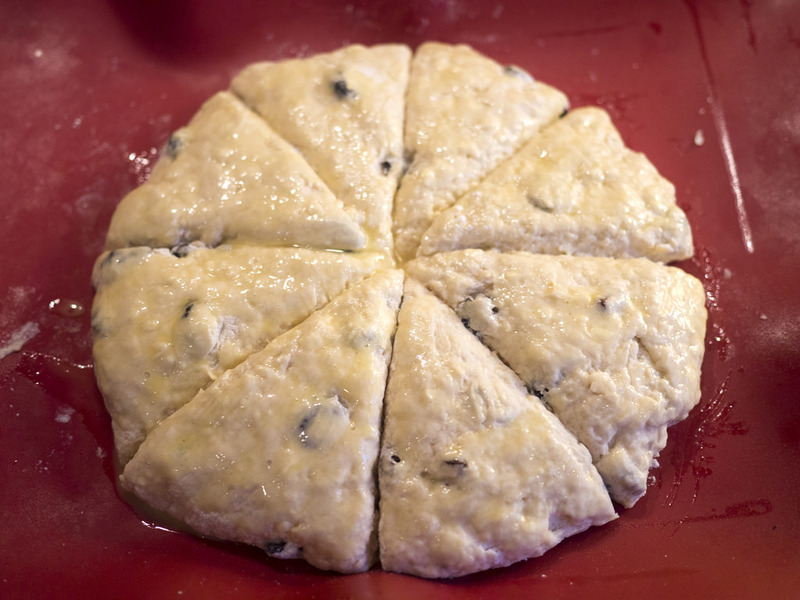 If you leave the sugar out of the recipe and substitute something like feta cheese or sundried tomatoes for the raisins, you have a great scone to go along with a bowl of soup! Pre-heat the oven to 220 C.
Mix together the flour, baking powder, salt and sugar, then rub in the butter and oil until the mixture resembles fine crumbs. You can do this by hand, or in a food processor. If you use a food processor, don't overwork the dough. A few short pulses will do it. Stir in the raisins, then make a well in the centre and pour in the milk. Mix with knife, using a cutting movement, until everything is roughly pulled together. The dough will be very sticky at this point. Flour your counter and your hands. Scrape the dough onto the floured surface. Knead very lightly to help work some of the flour into the dough, while shaping it into a round about 3cm thick. The “kneading” shouldn’t take more than a minute. The dough will still be sticky when you cut it. Cut into 8 wedges and place on a greased baking sheet. Brush each scone with the beaten egg, sprinkle with sugar and cinnamon and bake for 15-20 minutes until risen, golden and springy to the touch. Cool and then cover with a tea towel or put in a tupperware container to keep them soft for 2-3 days. These are delicious served warm with butter. Friedel has lived and worked in the Netherlands since 2009. In addition to writing for A Dutch View, she also writes about bicycle touring for TravellingTwo.com. Follow all the latest news from A Dutch View. Bakkerij Bril: A Famous Dutch Bakery Near Deventer. We're a Canadian family that's lived in the Netherlands since 2009. On this blog we share all kinds of gems: places we've discovered, tips for expats, favourite recipes and a bit of "urban farming" inspiration: balcony gardening, cheese making and other adventures! © 2019 A Dutch View. All Rights Reserved.